With the publication of Supernatural, Richard Smoley extends his appeal and considerable expertise in in the areas of alternative, esoteric, and occult Western religion and philosophy to a wider audience than he has yet reached in his several previous books. Trained in classics and philosophy at Harvard and Oxford, he first rose to prominence in the 1980s and 90s as a writer for, and eventually the editor of, the now legendary magazine Gnosis: A Journal of the Western Inner Traditions. In this latest book, composed almost entirely of essays that were previously published elsewhere (the majority in New Dawn, the long-running, Australia-based magazine about esoterica and the paranormal), he adopts a more personal and conversational tone that makes the presentation more accessible to all types of readers than some of his previous work has been. This impression is generated right from the first essay, “An Encounter with Ancient Wisdom,” in which he relates the story of his first meeting with a man named Glyn, “the closest thing to a Master that I have ever met,” when he (Smoley) was a college student and a member of Kaballah group at Oxford in the late 1970s. This combination of personal spiritual testimonial and metaphysical word-painting launches the book in a very effective manner, for it makes the rest of the essays unfold under the spell and shadow of Mr. Smoley’s personal presence, so that even when he leaves off with the first-person voice for long spans of paragraphs and pages, the reader always hears him speaking as himself, personal and present. The remainder of the essays cover a rainbow of subjects and people, including Nostradamus and the question of whether prophecy really works, the factual and mythical backstory to The Da Vinci Code, the 2012 phenomenon, Atlantis, the history and influence of Freemasonry in Western civilization, A Course in Miracles, the question of “hidden masters” who transcend the material plane, the New Thought movement and its famous “Law of Attraction,” the mysterious occult book known as the Kybalion, the question of demons and their possible reality, and the basic esoteric idea of reality’s dual nature in the pairing of the visible, material realm with a real realm of invisible powers, presences, and principles. His approach in all cases is to give the reader a succinct introduction to and summary of each essay’s subject while offering evaluative thoughts about the subject's significance, authenticity, reliability, and/or spiritual meaning and importance. What makes the presentation so engaging, apart from the intrinsic fascination of the subject matter and the wonderful ease and authority with which Mr. Smoley writes about it, is the freewheeling honesty of his thought process. This leads him to express open (and well-advised) skepticism about many things that a lot of New Agey “true believers” hold dear while simultaneously (and again, well-advisedly) arguing not just for the reality but for the crucial spiritual and philosophical importance of other matters that fundamentalist skeptics and materialists in the modern secular mold—the Richard Dawkinses, Sam Harrises, and Christopher Hitchenses of the world—go out of their way to scoff and gag at. His insights are particularly valuable when he talks about the specifically spiritual and paranormal subjects in which he discerns an authentic actuality, such as the existence of demons and the reality of the imaginary realm, and discusses the devilish difficulties involved in evaluating and dealing with matters so directly intertwined with the basic thoughts and consciousness of we-who-evaluate-them. Just about the only criticism that readily suggests itself is that, overall, the book is too short. The essays are all quite succinct, running two or three thousand words on average, but a couple of them barely reach a thousand, and this, combined with the casual tone of the prose, occasionally imparts a lightweight sense that's inappropriate for such an ably written book about such weighty issues. There's also a bit too much overlap among the essays from time to time, with information being repeated almost verbatim in a few places (a wrinkle that will probably be ironed out in the final published version; this review is based on an advance copy whose form and content indicate that it has another couple of editorial passes in store for it). And it's a soft criticism indeed that takes a book to task for being so good that its brevity is disappointing. Supernatural could have run to twice its present length and not begun to exhaust its excellence. In a (likewise brief) preface, Mr. Smoley characterizes the present historical era as a transitional period when, symbolically speaking, "the twentieth century has ended but the twenty-first has not yet begun. The age we live in is a waiting room" in which the two worldviews that have dominated the Western ethos, Christianity and scientific materialism, have both fallen into a crisis of authority and legitimacy. 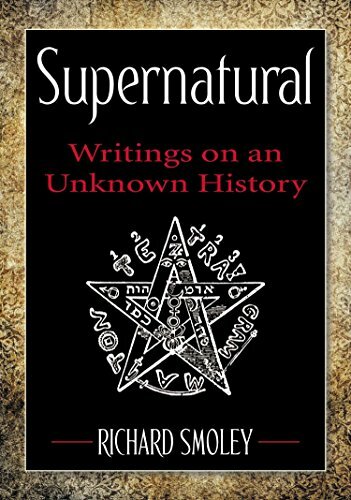 The author’s goal in Supernatural, he says, is to examine the alternative Western philosophical and religious traditions to see how they might speak into this impasse. "I believe the questions [raised by the essays] have to be taken seriously in the light of the whole range of human experience," he writes. "We don't need to reject paranormal experience en masse to convince ourselves that we're rational and skeptical people, but we do need to investigate them critically and insightfully." He also advances an explicitly spiritual purpose for the book: to call out a theme that he views as "the most important and sublime in all religious literature. It is the concept of the true 'I," the Self that exists within and behind each of our personalities. . . . I don't believe that anyone can experience this awakening [to the true Self behind the individual ego] without being transformed by it forever. It is to point toward this awakening that this book is ultimately aimed." Although Supernatural is not a spiritual instructional text but a broad informational survey, the reader comes away from it with the sense that Mr. Smoley really has touched on his stated goal. Somewhere behind and within the collective and shifting conceptual-cultural kaleidoscope of the subjects he has drawn together, the secret of that true "I" winks at us with a gaze of infinite wisdom and impenetrable mystery. To generate such a sense is no mean feat for a writer, any writer, to accomplish with mere words on paper. Matt Cardin is an author, editor, college teacher, and independent scholar focusing on the intersection of religion, horror, the paranormal, creativity, consciousness, and culture. His books include Dark Awakenings, Divinations of the Deep, and To Rouse Leviathan. He founded and edits the blog The Teeming Brain.